Award winning Lytham Brewery has come up with a special treat for cricket and real ale fans alike by honouring Lancashire star Steven Croft with his own beer. Crofty’s pale ale has been specially brewed and launched to coincide with the former Old Trafford captain’s 2018 Testimonial Year. 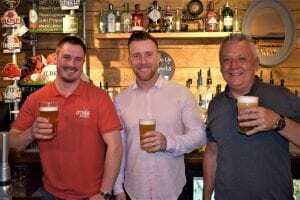 Blackpool-born Steven – who in 2011 went down in Red Rose cricket folklore when he hit the winning runs to seal Lancashire’s first County Championship title in 77 years – has been heavily involved in the brewing process and specially selected the ingredients for his beer. The result is a refreshing pale ale which is expected to be a real hit at pubs and cricket clubs this spring and summer. And the great news is 5p from every pint will go to Steven’s Testimonial Year Fund which is raising money for two charities close to his heart – Blackpool’s Brian House Children’s Hospice and the Professional Cricketers Association’s Benevolent Fund. Steven, who has played more than 450 times for Lancashire CCC and lives in Lytham, said: “I am really chuffed with the result and cannot thank Lytham Brewery enough for producing this wonderful ale for my Testimonial Year. “It’s fair to say I’ve enjoyed the odd ale or two down the years, but to have my own beer is something I never imagined. 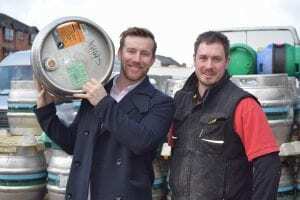 Lytham Brewery has become a Fylde coast success story since launching in 2007, supplying award-winning ales to pubs across the UK. Managing Director James Booker said: “We are delighted to be involved with Steven’s Testimonial Year. Steven’s a great lad, a great cricketer and we believe we have produced a cracking ale to celebrate his many achievements in the sport. “Steven helped select all the ingredients. The result is a refreshing pale ale brewed using pilsner malt and combination of hops from around the world. The light delicate body makes this beer very smooth and clean, giving it a nice hoppy finish. Crofty’s ale was launched at his local pub – The Taps in Lytham – and went down a storm with locals. It is now available for order by pubs, bars and sports clubs across the UK. Steve Norris, licensee of The Taps, said: “It’s a great drop – a perfect drink now the weather is getting warmer and the cricket season is almost upon us. If you are a licensed venue and would like to order Crofty’s ale contact Lytham Brewery by emailing info@LythamBrewery.co.uk or by calling (01253) 725440.